We finally made it to ‘Week 6’ of the One Room Challenge, and you know what that means: it’s reveal time! Click those links above to catch up in case you’re just tuning in, but as a general recap, my husband John and I moved into our retro brick ranch home back in 2015, and hadn’t touched our master bedroom other than to fill it with the furniture we had already collected over the years. Although we actually liked the existing mint paint color, the previous homeowners didn’t leave any color information behind, making touchups a major headache. So, we decided to start fresh with new white paint, a faux paneling feature wall, and lots of globally inspired decorative accents to bring it all together. I couldn’t be more excited to finally welcome you into our completely transformed master bedroom retreat today, and hope it can inspire a room transformation of your own this season. Click ‘Play’ on that video below (or hop over to YouTube here) so you can see the process unfold in action, and then you’re invited to keep scrolling for the full reveal in photo form. I really did my best to be adventurous when it came to the color palette throughout this room refresh. You probably noticed that the scheme is almost all natural earth tones, but the range of light-to-dark helped give the whole room a bit of high contrast edge. When I first started adding in the decorative accents, I struggled to find just the right balance. Everything was in that same sort of medium tone family, making the room look flat and boring. It wasn’t until I started playing around with dark gray and white, deep rusty reds on top of soft blue, and oatmeal over wood grain, that things started to feel lived in and intentional. I think the high contrast pairing that was really the “aha moment” for me was the dresser and the faux paneled wall. 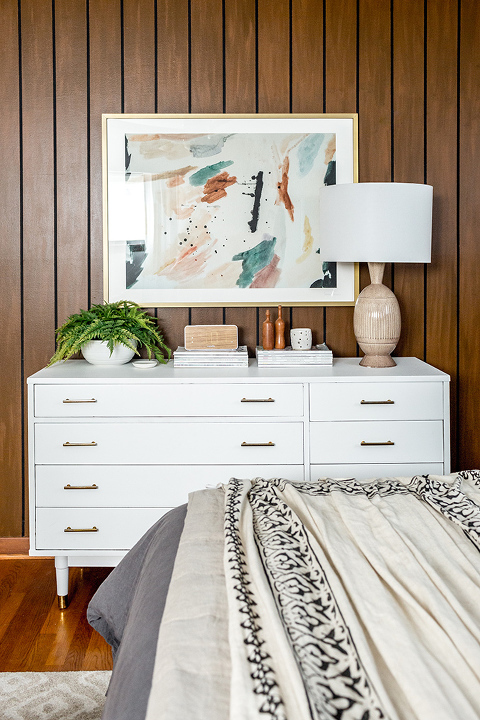 If you click back to the original reveal of our faux wood paneling, you can see that our vintage dresser sported white sides and wood drawer fronts. I liked how the dresser looked against the new feature wall, but it felt like something was kind of missing and it didn’t pop like I wanted it to. After staring everything down for a couple of days, I realized that the wood grains were just a little too jarring against each other, so I decided to paint the entire dresser white. The original veneer on the drawer fronts had always been a little worse for wear, so I didn’t feel guilty painting the wood white to match the already-white edges of our thrifted dresser. The new white dresser is now a star in the room, and I didn’t have to pay a dime to make it look brand new again. I just used white paint that we had left over from repainting the rest of the room (the exact color is “High Reflective White” by Sherwin Williams in case you’re curious). So, what’s actually new in the room? We managed to keep our collection of new-in items to a minimum for this space since I mostly shopped the rest of our home for accents, art, and décor, but one of my favorite additions to the space is the new bedding. 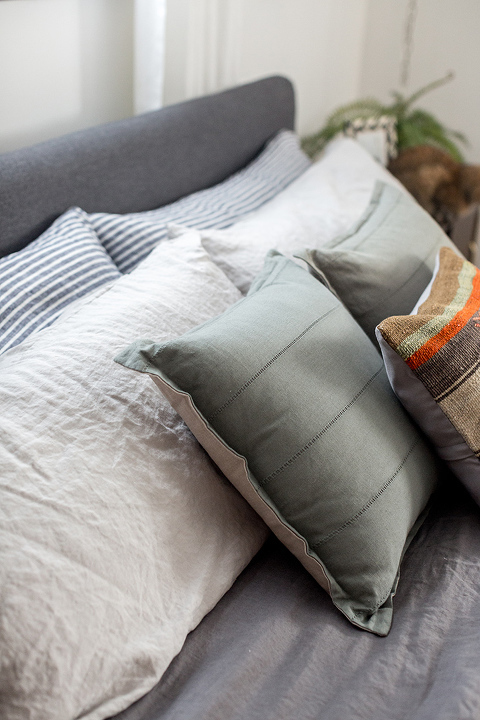 I spent a long time on the CULTIVER website choosing the perfect mis-matched collection for our bedroom, and ultimately picked out a dark gray duvet, set of light gray pillowcases, and a pair of striped cases, too. The green throw pillows are also new to the space (just $11 from the clearance aisle at Target! ), and that gorgeous multi-color vintage pillow in front came from Revival Rugs. It adds an unexpected hit of color and pattern that I love, and was the perfect replacement for the too-bold global blanket that, if you remember, didn’t quite make the cut. The far wall (where my taller dresser is) stayed largely the same. We still have an upholstered side chair over there, which we use all the time to sit and put shoes on, and to toss throw pillows on from the bed at night. I had planned on changing the white lamp out for this new teal one, but when I polled you guys on Instagram, the white lamp actually took top prize, so I returned the other one and am more than happy to appreciate what we already have. The rug is the only other piece that I don’t think I’ve addressed over the course of these past six weeks. It was originally intended for our family room and was unrolled there for the longest time, but it strangely never lay flat over the big plain area rug we also kept in the room. I was hoping to achieve a layered look with the smaller patterned rug on top and the oversized plain rug underneath, but it never quite worked. We kept tripping over the big wrinkles that formed (see what I mean in the photos here), so I decided to pass our existing shaggy bedroom rug along to friends, and then brought this one up from the family room. The new low pile rug is much more muted than the bold shag rug was, and I really like the subtle tone-on-tone pattern. 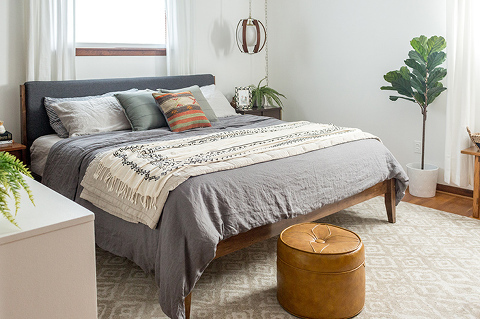 The creamy color grounds the space without taking too much attention away from things like the bedding and paneled feature wall, but the rug is still soft enough underfoot to make the bedroom feel luxurious. This project has been such a fun one to work on, but a bit humbling to tackle, too. I feel like it took me forever to find the right combo of textures and colors, and (for better or worse) it reminded me that I’m still learning as I go. I’m sure a professional designer could have knocked my vision out in a matter of days, but it also probably would have required a lot more buying of new items that we (clearly!) didn’t really need and definitely a bigger budget overall. Our budget constraints sort of forced me to make the most of our existing home décor, but that turned out to be the best lesson from this project: that you can make a room look brand new just by repurposing the supplies, art, and textiles that you already have lying around. So, what do you think?! Make sure to hop over to my YouTube channel to see the transformation unfold in real time, including my to-do list for the project start to finish. 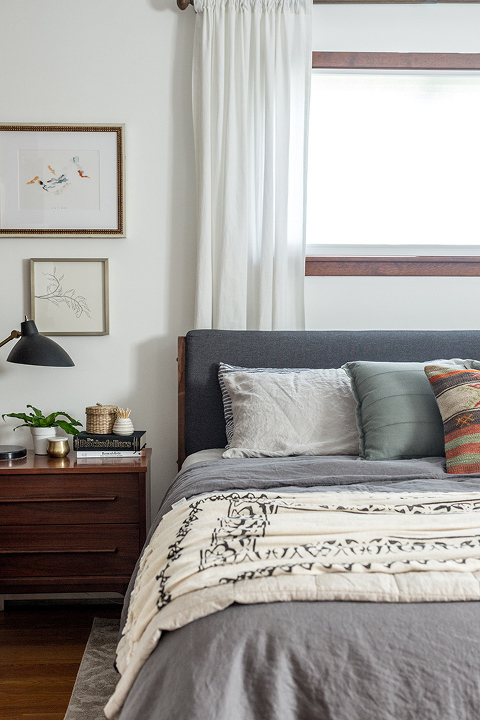 Afterward, feel free to leave your thoughts on our reimagined bedroom in the comments below, and visit the One Room Challenge event website hosted by Linda, of Calling It Home, for more design inspiration. **I earn a small percentage from purchases made by the affiliate links above. Affiliate links are not sponsored. You can rest assured that I would NEVER recommend a product that we don’t use and love ourselves!